It's all about enjoying the beauty of New Zealand Stamps and the history behind them. What is New in this Blog? Military ANZAC - Part One. Military ANZAC - Part Two. Lord of the Rings - The Hobbit - An Overview. Health Stamps - Part One. Health Stamps - Part Four. Christmas Stamps - Part Two. Christmas Stamps - Part Three. Scenic Stamps Series - Part One. New Zealand Wine Post - Overview. Antarctica / Ross Dependency - Part Two. The game of golf followed the Scots to New Zealand. It all began in Dunedin when a young whisky distiller named Charles Howden called a meeting to form a golf club in 1871. The game grew slowly when a surge in its popularity in Great Britain was mirrored in the colonies. 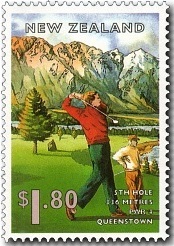 In 1899 a national golfing body was formed in New Zealand. And over the decades the game has boomed, growing from strength to strength. 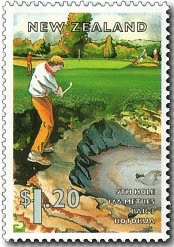 In 1995 when these stamps were issued, nearly 113,000 registered golfers enjoyed the sport, year round. Just as New Zealand is well known worldwide for its beauty, so too are its golf courses. 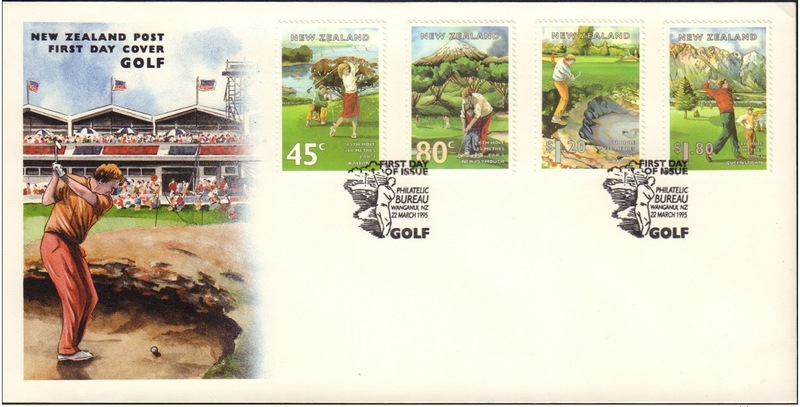 This special issue of golf stamps depicted four of the country’s most attractive golfing venues. Each of these courses provide a showcase for the natural splendour of their region. The four stamps of the 1995 Gulf Courses issue. 45c - Waitangi Golf Course. Situated just a few kilometres from the site where the Treaty of Waitangi was signed, the Waitangi Golf Club’s course draws many overseas visitors every year. There are fabulous views across the water of the Bay of Islands from 15 of the holes. 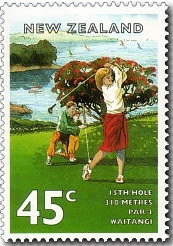 The stamp depicts the 15th hole, a par four with a length of 310 metres. 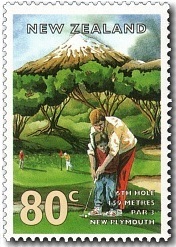 80c - New Plymouth Golf Course. This superb golfing venue has hosted several national, international, amateur and professional tournaments. There are hundreds of mature pōhutukawas (native New Zealand 'Christmas' trees) lining every fairway. The golfer and child on the stamp putt the 6th hole of the course together. This hole is 150 metres in length and a par three. The symmetrical cone of Mount Taranaki/Egmont provides the perfect backdrop. $1.20 - Arikikapakapa Golf Course, Rotorua. The ninth hole of the Arikikapakapa course in Rotorua is unique in being guarded by volcanic chasms. Steam vents, mud pools and craters of old geysers are a feature of the venue - it must be the only golf course in the world where you could get burned if your ball lands on the rough! This is one of New Zealand’s oldest courses. $1.80 - Kelvin Heights Golf Course, Queenstown. Queenstown is simply one of the world’s chosen spots. And this course at Kelvin Heights takes full advantage of its beauty. The course abounds in trees and the waters of Lake Wakatipu sparkle on three sides. The illustration shows the 336-metre long fifth hole of the course, a par four. Rising steeply in the east to complete the picture is the spectacular Remarkables mountain range. First Day Cover - 22 March 1995. Date of issue: 22 March 1995. Designer: Ross Jones, Wellington, New Zealand. Stamp sizes: 28mm x 40mm. Sheet sizes: 100 stamps per sheet. Perforation gauge: 14.3 x 14.3. Paper type: CPL red phosphor. Period of sale: These stamps remained on sale until 22 March 1996. Information & images for this post came from. 1997 - Roses - Joint Issue with China.